Hello! I have been gone for a minute, but always remembering all my faithful readers. Today, I want to share what came to me today. By nature, I am a visual learner. In order for my mind to grasp things in a more profound way I have to see it. Like many of you I am too, an over thinker. I think and analyze EVERYTHING! At times I am guilty of going to the extremes. So to put my thoughts in order I use mind nodes or in old school lingo – brain maps. They help so much to create a visual escenario of what is going on in my mind. This way I can “see” the thoughts and “clean” those that do not need to stay. As I was storming through the thoughts of the current process God is taking me through; I wrote my thoughts to get a better perspective. I can’t post everything I wrote, of course, but I do want to share the last link I added. 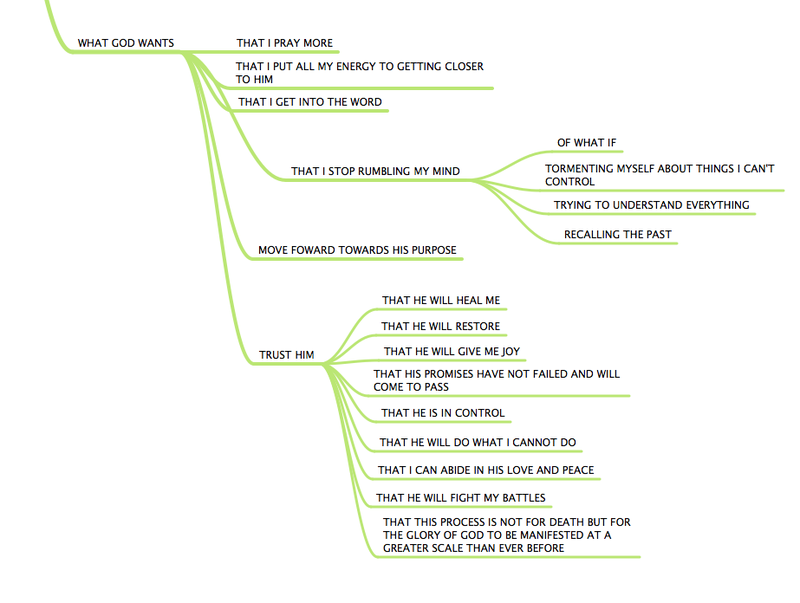 I titled it “What God Wants.” When we follow God for a while we tend to wonder what God wants for me and what He wants us to do. Every time I go through a trial or breaking process that I need fresh godly perspective I add this title to one of the mind node branches. It helps me see and focus on the right thoughts that are in my head but the clutter of frustration, disappointment, and confusion don’t let me see.